Experiences with Unite, GMB, USDAW at, amongst others, Sainsbury's distribution centre, Waitrose warehouse, Bakkavor food factory, Alpha LSG airline caterer. We are well aware of the ideological trap: coming from a left-communist background we have to remind ourselves that an analysis of the trade unions and their role is not something that was done and dusted in 1914 – 23 and has confirmed its historical truth ever since; rather that this analysis is a permanent process in our day-to-day experiences. We wrote stuff about how we see the problem of trade union forms of struggle in general , here we will just write down very briefly our concrete experiences in West-London so far. The reports surely are anecdotal, which doesn’t mean that they are not representative. Before we even started working in West-London some of us joined GMB and later on Unite, hoping that there would be local branch meetings where we could meet workers from various sectors, but in the last one-and-a-half years we did not come across these kinds of social spaces within the union structure. The GMB organised a strike of cleaners and porters employed by Medirest at Ealing Hospital in 2014, demanding the London living-wage. Workers, most of them of migrant background, told us that it took about a year to go through all the bureaucratic work to actually go on strike. When we went to the strike the ‘picket’ was set up on a roundabout in front of the hospital, after management had obtained a legal order that no picket line would be allowed near to the entrance. The company brought in workers from other hospitals to replace the strikers, which undermined the impact of their walkout. The GMB neither tried to contact the other hospital workers, or Medirest workers at other venues (e.g. caterers at Chelsea stadium), nor did they provide a leaflet for hospital staff and patients informing about the dispute. The strike lasted for a bit more than a week, there was concern about the lack of pressure on management. In the end management and GMB agreed on a wage increase of £1 p/h, raising the wage from £6.50 to £7.50. In the warehouse the old permanent workers earn £9 p/h plus, the permanents hired after 2012 get the minimum wage, as do the temporary workers. Of the total workforce maybe 20 to 30% are union members. The ‘new permanents’ are pissed off with the wage gap. There have been various meetings between USDAW and management about the issue, but without result. The main union reps are older permanents with higher positions, e.g. supervisors, trainers or responsible for health and safety stuff. The main rep never addressed the temporary workers regarding the union. He is a loud mouth and slags off the bosses with the workers, but generally friendly with management. He said that he had been offered a manager position, but instead he trains new people on the forklifts as well as normal warehouse work and gets a ‘near to management wage’. When the agency cut the overtime bonus for the temps and most temps refused to work overtime – which put the company in a difficult position – he openly worked double shifts and on days off. On days off he earned £22 p/h. He said that he thought it was good that they cut the overtime bonus for the temps and that the temps now refuse to do overtime, because due to lower wages the company had tended to give overtime to temps rather than to permanents. 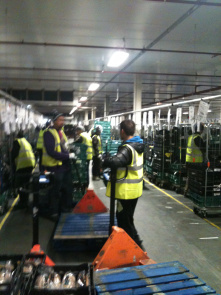 For two weeks external company advisors ‘analysed’ the work and productivity of the warehouse workers. The union reps had discussions with management about this and the new targets, but not with the temp workers. The union held meetings with the permanent workers, from which the temps were excluded, but even the permanent workers could not really say what the meetings were about – which is not just a language related problem. The Sainsbury’s distribution centre is across the road from the Waitrose warehouse mentioned above. Both warehouses are run by the same logistics company Wincanton, which employs temp workers through the same agency. Despite these similarities the sites are ‘represented’ by two different unions, USDAW and Unite. We started working at Sainsbury’s as temps, who made up about 60% of the warehouse staff. None of them were members of the union, and probably less than half of the permanents were. So, how would a temp worker get to know about the union? First of all, there was a union board, which only announced that three months before the union had agreed (with a narrow majority of votes) to a pay increase offer of 2.2% for the permanent Wincanton workers. After several weeks we spotted a union rep on the late shift, she wore her union high-vis. She spoke mainly to our line-managers, most likely because they started working with her several years ago and worked their way up together. This was basically all that was seen of the union for several months. We were not sure whether we could trust her, so we just told her at some point that we had joined the union – we were the only temps with union membership. She did not react to it, at least she did not jump at the possible chance to organise more temp workers. We thought that there was no practical use in asking our temp-workmates to sign up to the union, if there was little chance for a short-term plan of action that could improve things. Under the given conditions of high turnover, such a plan would not be able to exceed three to six months if you want to mobilise people. When we had our disciplinary meetings with management after the slow down ‘strike’ the union rep tried to avoid representing us, even as individual members. We phoned the regional Unite office, but they just referred us back to the shop-floor reps. In the end it was clear that she did not want to risk her position with management for some unruly temps. This might be understandable from her point of view, given the general weak basis of the union in the warehouse and the aggressive history of Wincanton management when it comes to industrial disputes. One of us works as a temp at the Bakkavor ready-meal factory in Park Royal. Bakkavor is a multi-national corporation and employs up to 2,000 workers in various plants in West-London. There is a GMB union representing permanent staff, who have their own office in one of the bigger factories. The fact that permanent staff with five, ten, fifteen years experience still earn £6.79 per hour (this is 9 pence above the minimum wage!) says something about the union’s position. The permanents still get overtime bonus (time and a half), which means that workers top-up their meagre wages by working 50 to 60 hours per week. The workers’ composition at Wealmoor – a fruit and veg warehouse and packaging plant – seems to be more preferable for union organising compared to other warehouses, due to the fact that all the workers are permanents, the workforce is relatively large (around 200), the staff turnover is relatively low, while wages are not exceeding the minimum. A friend who works at Wealmoor told us that he was approached by a GMB organiser, telling him that the GMB had an interest in organising the place. Our friend became a member and agreed to help out. A first leafletting session failed, because leaflets were not ready, a second attempt happened in mis-coordination at a time when our friend was not at work. After distributing one flyer the organisers seemed to realise that communication with the largely asian workforce would require more energy than expected and they left it at that. A friend of ours worked at Alpha LSG airline caterer. He is a workers’ activist with years of experience, but only found out about the fact that there is a Unite union representation after several months. The union seems to concentrate on the drivers, who pick up the stuff from the warehouse/kitchen and unload it onto the aeroplanes. Alpha LSG has a history of mergers and rather tragic industrial disputes in the past . During distribution of our paper we spoke to drivers, who have an ‘individual dispute’ with management about the continuation of terms and conditions from their old contracts. They said that the union was not being too helpful in their case, just telling them to hold on and they will sort things out. This had been going on for some months. If this is on the level, I suspect that this would be ripe for major recruitment. If you make contact, I would be happy to come down and meet them and discuss our campaign in Swindon. We thought this small report below is interesting because it questions to a certain extent the current ‘we pay the living wage’ advertisement of various retail corporations, such as Lidl or Ikea, and the union cover for it. This comes after Lidl sacked a worker who had questioned Lidl’s pay policies on Facebook. That is about as much coverage if any that you will hear about in mainstream media. The reality is a stark double edged sword. The new wage deal sees the end of the company’s Sunday premium currently paid at time and a half, quite ironic when USDAW ‘The Campaigning Union’ who organise predominately in the retail sector, are fighting the governments propositions to deregulate Sunday Trading, yet are trading away Morrison’s Sunday premium. Are they not in fact preparing for it becoming a normal working day? Or in fact accepting it already is one? The Sunday premium isn’t where it ends. Overtime, late and early premiums are being scrapped. Forklift drivers and café cooks will see there supplements disappear. People who started with the company after December 2013 will only receive service rewards at 5 year intervals, although people who have worked for the company since before that date won’t be effected and still receive it every year (for people who started work prior to December 2013, they have to work 5 years before they can claim their first service reward). Finally but my no means the smallest in this wage offer, paid breaks will disappear taking the working week down to 36.5 hours (39 hours minus paid breaks). The concerns of many rank and file USDAW reps within Morrison’s (who don’t negotiate pay, apart from a select committee who sit with the National Officer) is that Terms and Conditions are being traded away for a higher rate of pay, and given this governments appalling attacks on working tax credits and cuts to peoples benefits are the members realistically going to be any better off? So what exactly are USDAW doing about all this? Well they recommend the members accept the company’s offer when casting there vote in the pay ballot. First of all it is worth noting that warehousing or food production is not an ‘un-organised’ sector and that workers employed in this sector are not ‘un-organisable’ from a trade union point of view. The problems lie deeper: there are unions in the sector, but at large they are not able to overcome the division between permanent and temporary workers and/or to enforce considerable improvement of conditions. We will continue looking for the potentials of meeting other workers’ militants within the local union branches, but even that seems difficult. Which means that we are having to create these spaces of direct solidarity ourselves. The main union reps are older permanents with higher positions, e.g. supervisors or trainers. The main rep never addressed the temporary workers regarding the union. He is a loud mouth and slags off the bosses with the workers, but generally friendly with management. Really interesting write-up, thanks guys! You mention doing leafletting a few time and I'm wondering if you've had much success with leaflets? I ask just because I've never seen a leaflets have much effect in a "cold" shop. I think they can be a tactic in a dispute, but I've just never known them to be an effective organizing tool. Anyway, be curious to hear about your experiences? Yeah, very interesting piece, thanks for doing the work and taking the time to write it up. Although I do have a question. Now I have a structural critique of the unions and the role they play in capitalist society (negotiating the sale of labour power etc, and being substantially dependent upon the success of individual capitalist enterprises and the national economy, which essentially ties them to capitalism and the employers), however a lot of the problems you refer to above aren't structural or systemic problems with unions, but are just because of "bad unions". And unions are democratic organisations, at least at a shop/branch level. So it seems that if you wanted to you could probably take over the union organisation at some of these places, or at least get involved and change things. Is there a reason you haven't done that? Do you not think it would be worth trying, and then writing about your experience? Informative. Thanks for the write up. thanks for the comments. just a quick response regarding the use of leaflets and the question of becoming union reps.
*** we used leaflets in largely three different situations, with different goals and outcomes. a) we distributed a leaflet the day after management announced the cut of overtime bonus at the waitrose warehouse. the leaflet was able to hit a nerve and contributed to the discussion and people not signing the new contract. it was a pretty much ideal leaflet situation in a warehouse complex with at least five different sub-units, where workers have little chance to mingle. *** we don’t want to get into a general discussion about the unions, but saying that it is mainly a question if ‘good or bad’ people do the union work seems a bit superficial, ignoring the underlying material divisions and management policies in unskilled/labour-intensive sectors like warehousing and food production. in many places becoming a union rep would mean to become permanent first, which in turn requires to work like a dog, have good connections with managers and keep your mouth shut for a year or so. once you are permanent it is unlikely that you will become very popular with the other permanents if you say that we have to fight for the temps - which makes it unlikely to get elected as a rep. in other shops, where most workers are permanents (kerry foods, bakkavor), the link between gmb and management is so strong, that getting a foot in there through official union election stuff is a sure ticket for individual victimisation, even before any collective stuff can take place. this we see as a big hurdle. may be it is worth trying taking it, but then there are various experiences which tell us that even if you manage to ’take hold of the union’ in your shop, you will mainly fight an uphill battle with both management and union bureaucracy: iww comrades in Northampton were kicked out of unite for having been too militant; the gate gourmet women workers in Southall were stabbed in the back by the T&G etc. all power to the independent committees and worker collectives! I don't know the situation in the warehouses, obviously, but I've never worked anywhere where rep elections were contested - least of all in workplaces with a low rate of unionisation. And while I have no love for the unions and accept your larger critique, I'd imagine it'd be possible to develop a good enough relationship with the permanents - through support, advice, etc - where they'd respect you enough on their issues to allow you to be elected, even if they disagreed with your approach to the temps. In other words, I think self-interest would win out. I'd imagine hostility towards the temps could be overcome by a potential rep demonstrating they'd be good for the permanents on their issues, no? Nothing to add, but just want to say good stuff. Very interesting reading. Part of the problem might be that as the jobs the comrades have are very precarious, it would be difficult even to be there long enough to stand as a rep, and if you did you might lose the job soon afterwards. Part of the problem is that the existing union structure doesn't deal very well with having a large part of the workforce on temp contracts. Also, difficulties between temps and permanents are a really fractious issue and people might well elect you as a rep but then quite possibly still have massive objections to taking any action in support of temps. I don't think anybody's arguing otherwise, my friend. I just think in this instance the perm/temp problems - while they may be exacerbated by the unions - seems like they go deeper than the union, so any organizing approach is going to have to face them. I guess I just think we should be aware of the problems unions bring, but also of problems that exist regardless of or alongside union divisions.